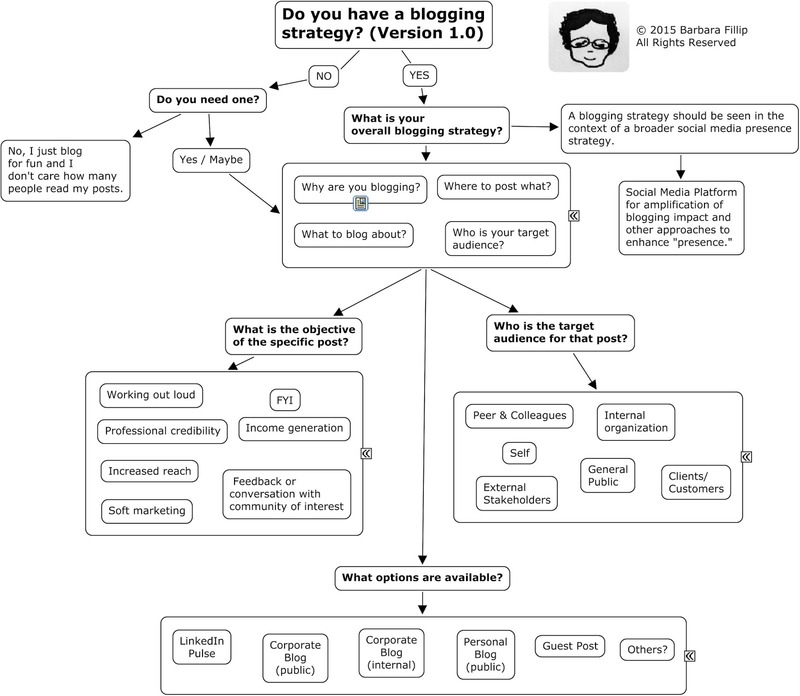 A LinkedIn blog post and mindmap posted by Marco Bertolini (Ou faut-il publier: Sur un blog d'entreprise ou sur Pulse de LinkedIn?) 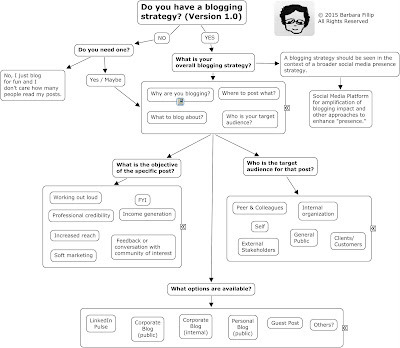 a week or so ago prompted me to think about my own blogging approach. The map below is meant as my initial effort to conceptualize how to think about it. "Think before you post" in this context isn't so much about whether or not to post (though that comes into play in terms of WHAT to post), but more about WHERE to post WHAT depending on the nature of the post and the intended audience. Click on the image to view in other window/enlarge. I consider this map to be "half-baked", definitely a work-in-progress, and therefore I'm comfortable posting it here on my personal blog rather than as a response on the LinkedIn platform. Still, there are ways to create linkages between the two without creating unnecessary noise (see Nick Milton's post about the Signal to Noise Ratio on Social Media). The more natural the linkages, the better. In addition, since I want to promote the idea that maps are thinking tools, I have purposefully NOT connected specific items on the map. Draw your own connections! That's the idea. I don't have the solution for you, just a possible thinking framework.